Private student loans for bad credit borrowers are difficult to locate. While the government extends need-based loans that may mitigate the affect of bad credit, most private lenders are looking for borrowers with a good financial history in order to extend financing. If your income is too high to qualify for a need-based loan but your credit is poor, you will encounter difficulty getting the funding needed. One key reason why student loans are hard to come by is your lack of income while attending school. 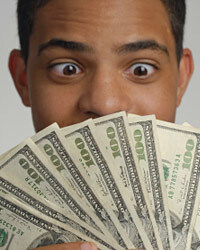 Even bad credit borrowers with high incomes can usually find loans for items such as homes or cars. However, without any money coming in while you go to school, there is little you can offer a lender to show you can make debt payments. They will be extending the funds in hopes you will locate a high income after graduation. This is easier to do in a good economy than during a recession. If the job market is weak when you apply, you will have a harder time getting the loan. Most students can make only minimal payments while they attend school, if any. This means they will need to have longer loans that allow them to assume most of the burden after graduation. The long loan terms are not favorable to a lender who would like to collect as soon as possible on the debt. You can partially overcome this by agreeing to make payments on the debt while you are still attending school. Working while you are in school is one way to may payments. Even students who work while in school will often have inconsistent incomes and expense needs. There will be times of heavy expense, such as the beginning of a semester. There will also be times when a student can make large payments, like over the summer break while the student is working. The same is true after graduation. Some students will find jobs immediately and make payments. Others will need more flexibility if they have difficulty locating solid employment. Lenders do not like to loan to people who do not have some stability in both their needs for funding and in their ability to pay. Taking into account the factors above, you should look to overcome them one by one. For example, you can overcome the fact you do not have an income while attending school by working as much as possible on your breaks. Students who work during winter and summer recess can make thousands of payments toward a loan during the year. They may also opt to use these funds to pay for living expenses, reducing the total financing required to attend school. Other students will look to work-study options. This allows them to continue working during the school year by finding on campus employment. This will shorten the length of the loan and require the lender to be less flexible with repayment terms. Credit Cards For People with Moderately Bad Credit?Tips - Applying For Credit Cards Despite Bad CreditWhat is a Direct-to-Consumer Private Student LoanShould The Government Guarantee Bad Credit Credit Cards?